For maximum accuracy and shelf life, all items will be sent directly from our temperature-controlled facility in the USA. Once your order is placed, it will be processed and shipped within 24 hours. Items are shipped via USPS Priority Mail, which offers a 1-3 day service to any address in the USA. All shipments include both tracking and insurance. Depending on your country of residence, you may see abnormally-high shipping charges after adding your item to the shopping cart. In this case, please contact us and we will manually process your order. International shipping to most countries is typically 7-20 business days. Shipping times do not include possible customs delays. Recipient is responsible for any taxes, duties, or customs fees. Our products are priced and packaged for individual use. To order more than 5 test kits, please contact us. 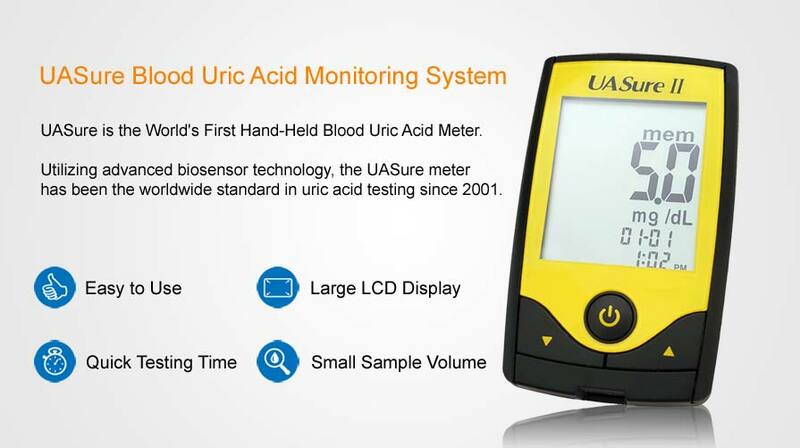 Regular screening and long-term follow-up of blood uric acid concentrations are important in the detection of asymptomatic hyperuricemia: a medical condition which can contribute to certain renal diseases and can also lead to the development of primary and secondary gout if ignored. 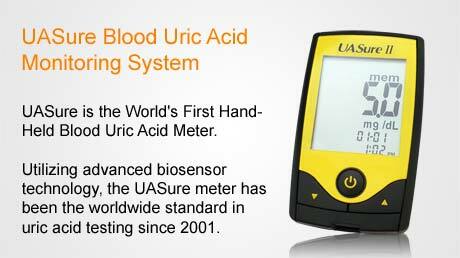 The UASure Blood Uric Acid Meter can assist with the quantitative detection of elevated uric acid levels as well as uric acid metabolism disorders. 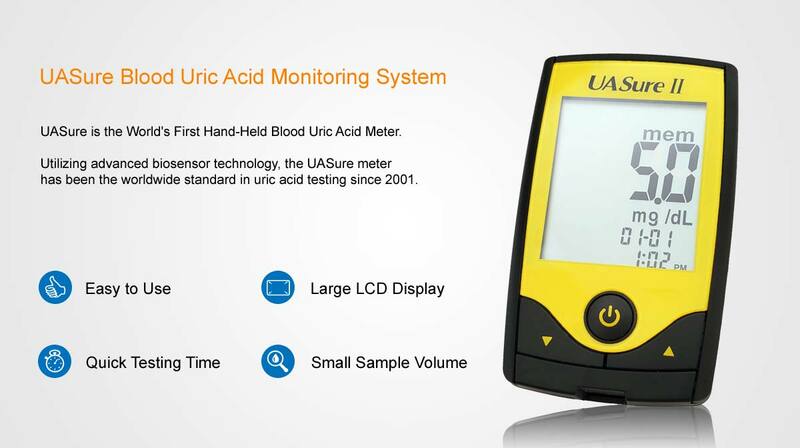 Biomedical screening and long-term follow-up checks of uric acid concentrations are important steps in the detection of asymptomatic hyperuricemia and the prevention of gout or renal disease as a result of hyperuricemia. Copyright © 2019 UASure USA. All rights reserved.